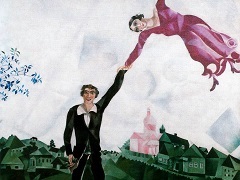 One motif in particular suggested itself to Chagall in his desire to unite the freest development of color with a natural theme so that each would influence the other; this was the flower piece. Here the assimilation of an abstract orchestration of color to the colors offered by nature could be carried out with comparative ease. 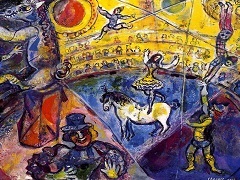 The theme had already cropped up in 1924-25, but the fireworks display of iridescent colors he was using at that time prevented the achievement of the chromatic assimilation he was seeking. 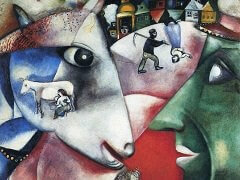 In the spring of 1926 the theme again presented itself. 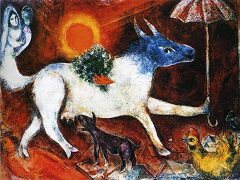 In tackling it, Chagall - in full accord with Paul Cezanne - tried to lift out of nature's display of colors a chromatic pattern whose tone and form would agree with the natural impression as well as with the ornamental distribution of color on the surface area. Some of the pictures are painted very thinly and leave large portions of the white ground un-touched, as in Cezanne's watercolors. One of these, Flowers in Mourillon, looks indeed like a tribute from the Russian to Cezanne. 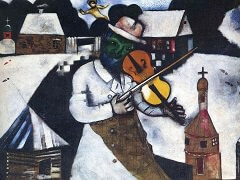 The surroundings were favorable to Chagall's undertaking. 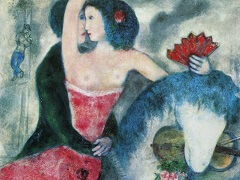 Already at work on the gouaches to the Fables of La Fontaine, he had taken a break and, together with Bella, had journeyed to the Mediterranean in the spring of 1926, to Mourillon near Toulon. Mourillon, which has now been swallowed up by Toulon, was only a small fishing village in those days, and the brightness of the sea still lay untarnished beyond the shore. The bunches of flowers that Bella brought home from the village market shone triumphantly in the window before a wide view or glowed warmly in the house. 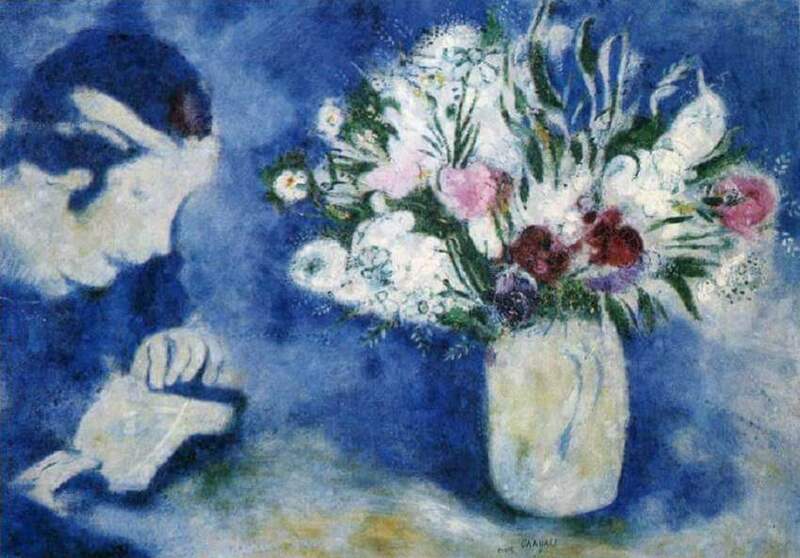 With the exception of a few burlesque scenes of sailors from the harbor life of Toulon, flower pictures were all that Chagall painted during these weeks of vacation. Bella in Mourillon is an example from this series and is the most intimate. The dusky atmosphere of blue modulating to white fills the whole room with monochromatic light which also enfolds the figure of Bella sitting lost in her work. An aura of calm and lyrical intimacy emanates from this tender flow of blue, and, by the vague definition of detail which suggests rather than describes the presence of Bella, evokes that mood of dream and absorption which surrounds someone in meditation. The simple bunch of flowers in an ordinary vase is there as if in celebration of this tranquillity. Its whiteness gathers the light energy of the blue ground like an aureole around it. The color values of the flowers make up a passage of great delicacy, which ascends from blue-violet through purple to pale pink. Green makes the contrast. An intense blue is concentrated around the ivory of the vase and provides the basic chords of the gentle music arising in a muted cantilena from the combined blue tones. The individuality of the separate flowers, and also the position of the vase, have the same vagueness of definition, somewhat removed from reality, which corresponds to the dreamy mood.